This conference explored ‘Americanization’ in new perspectives as well as in new comparative constellations. A central concern was to advance scholarship on "Americanization" by asking for the experience of Central and Eastern Europe focusing on the years 1945-1989. Here "Americanization" figured within a political, cultural, and economic context that defined itself in sharp contrast to "America." The contributors used case studies to elaborate the various and distinct processes by which consumers adapted, imitated, and creatively appropriated American culture. A broad spectrum of disciplinary perspectives and individual geo-biographical horizons came together to stimulate discussions that examined the ambivalent codes in which American commodities and cultural practices interacted with local contexts. The format of the conference was designed to allow for a maximum of exchange between the participants. Most notably, exchanging drafts and papers prior to the meeting contributed to the conference's success: Nurtured by the great variety of case studies, common patterns, methods, and interests emerged which can now serve as the basis for further inquiry. 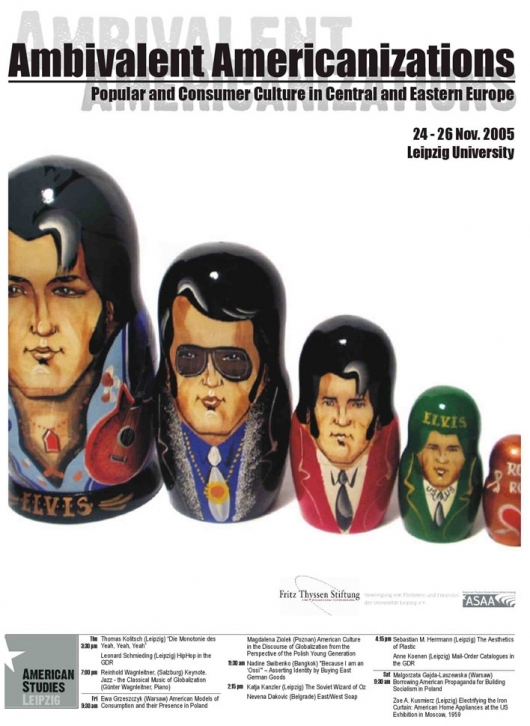 The conference's contributions have been collected in a volume "Ambivalent Americanizations: Popular and Consumer Culture in Central and Eastern Europe" (Winter, 2008). The conference was part of an ongoing research and teaching project involving faculty and advanced students at the University of Leipzig. For further information please contact: info@ambivalent-americanizations.de.